Check out our bus trips and social activities. Or browse through more of our seniors programs online through eReg. If you need assistance, call Customer Service at 604-987-Play (7529). Through our partners, we offer an assortment of bus trips and social activities for you to enjoy. North Vancouver has a growing population of active adults aged 55+. A number of community service organizations provide seniors programs and services at many convenient locations. The Youth Outreach Program - offers a variety of services for youth ages 10-24 who are potentially “at risk”, providing one to one support, school office hours and after school programs, group discussions and class room presentations. The Red Cross Health Equipment Loan Program - offers the North Shore community a free short-term loan (three months) of medical equipment such as mobility and bath aids. The program relies on donations. Capilano Community Services also provides administrative support to the following non-profit agencies - Canadian Hard of Hearing, North Shore Branch, Lionsview Seniors Planning Society, North Shore Community Foundation, North Shore Keep Well Society and North Shore Restorative Justice Society. For more information, phone 604-988-7115 or visit their website. Lynn Valley Services Society (LVSS) at Mollie Nye House is a vibrant community centre in the heart of Lynn Valley. This lovely heritage building, located at 940 Lynn Valley Road, provides a community gathering place offering a wide range of activities for all ages, in a setting where residents feel a sense of belonging and welcome. LVSS at Mollie Nye House offers a wide range of senior programs with over 12 drop in programs such as line dancing, stamp club, arts and crafts, music groups and darts or table tennis. Registered programs with a focus on fitness, well-being and personal growth are offered. These programs include Tai Chi, Better Balance with Surefeet, Adult ESL and special seasonal workshops. LVSS works in close association with the Lynn Valley Seniors Association. Membership for the LVSA is $20 annually and members receive a discount for all drop-in programs. To learn more about the LVSS visit their website. For more information on Mollie Nye House, please visit their website or call 604-987-5820. 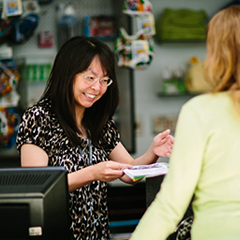 North Shore Community Resources Society, located on the 2nd floor inside Capilano Mall, provides information and referrals on services, resources and activities available to seniors on the North Shore and throughout the region. If you are interested in volunteering, visit Volunteer North Shore. This program promotes and encourages volunteering, offers interviews, and refers volunteers to community organizations who are looking for volunteers. The Caregiver Support program assists people who are caring for an adult friend or family member by providing supportive networks, activities and workshops for caregivers. North Shore Better at Home supports seniors’ independence by providing them with basic non-medical services to help them remain in their homes. The Legal Services program assists people with legal problems through the advocacy or information support. For more information, call 604-985-7138 or visit their website. North Shore Neighbourhood House has a long tradition of providing social, recreational and childcare services to North Shore residents. Located at 225 East 2nd Street in North Vancouver, their services are directed towards improving community health and well-being. Many programs are offered out of other North Shore locations. Neighbourhood House delivers seniors programming at the John Braithwaite Community Centre, which they operate in partnership with the City of North Vancouver and the North Vancouver Recreation and Culture Commission. Visit the North Shore Neighbourhood House or call 604-987-8138 for more information. Parkgate Community Services Society offers an extensive range of programming for seniors living in the East of Seymour area. The Society offers programs at Parkgate Community Centre, 3625 Banff Court. North Vancouver Recreation & Culture also offer a number of seniors' programs in the same facility. Visit the MyParkgate website or contact 604-983-6350 for additional information. Silver Harbour provides a gathering place, recreational activities, and social services for local seniors at 144 East 22nd Street in North Vancouver. The Centre offers a wide variety of activities including physical fitness, martial arts, indoor sports, games, visual arts, performing arts, languages, computers, cultural groups, special events, outings, and informative seminars. It also provides a number of important services such as legal advice, low-cost meals and refreshments, information and referral, affordable clothing and household goods, transportation, and volunteer opportunities. For more information, visit Silver Harbour Senior's Activity Centre or call 604-980-2474 to learn more. North Shore Eldercollege Society is a not-for-profit organization run by volunteers who share a love for learning. They focus on delivering general interest classes that promote with an emphasis on intellectual stimulation in a social setting. From archaeology to zoology and everything in between, their classes have an emphasis on thinking, learning and enjoyment. Their affordable classes are offered in convenient locations across the North Shore. Come learn with us! Lionsview Seniors Planning Society seeks to ensure the participation of seniors in planning processes-including community planning, health planning and social services. Lionsview also fosters and facilitates networking between local seniors organizations and agencies. Visit the Lionsview Seniors Planning Society or contact Tom Carney at 604-985-3852 for more information. The District of North Vancouver's Community Service Advisory Committee advises Council on a variety of current social issues. The committee also evaluates grant applications and makes community grant recommendations annually. Contact Robyn Newton at 604-990-2274 to learn more.